All of the borders from Pocketful of Posies are finished and the artwork is hung at Highfield for the first leg of the tour. The book release party will be held at Highfield Hall in Falmouth, MA on Sunday, Sept. 26, from 4 to 6pm. I hope to see some of you there! I still have some photos which show the border making process for a few more illustrations. This one incorporates two different rhymes, Jack Sprat (who ate no fat) and Deedle, deedle dumpling, my son John (who went to bed with his trousers on). The gray of the driftwood house is too monochromatic for me, so I added a favorite color combination of orange and blue to the figures and props. I used cool colors on the felt border, allowing the warmer browns and oranges to pop out visually. Jack Sprat and his wife are holding doll house utensils. I embroidered the border pieces with variegated thread. 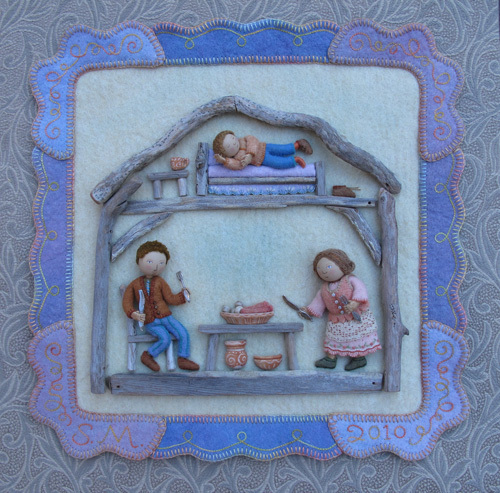 The driftwood beams and floor boards are sewn onto the felt background through tiny drilled holes. No dreaded glue! Now that I think of it, I did use some glue on the furniture. But sewed son John’s bed in place. I can remember really liking the process of building the house, which was so different from sewing. There was sawing, sanding, drilling, carving and whittling. Sawdust mingled with threads on the floor. Note: See other posts from the Pocketful of Borders series here. This entry was posted in Children's Books, Fabric Relief, Felt, Found Objects, illustration, Pocketful of Borders, Posies Traveling Show by Salley Mavor. Bookmark the permalink. Awesome!! I just love your attention to details and your stitching is terrific!! That curved driftwood for the roof is perfect! How sweet the little bed in attic is! The colors are really wonderful in this. Imagine the feeling when a person forgets to attend something very special to her, that was written on her calendar, AND posted on the right column of her blog, and was thought about all week with anticipation …and only at 6:20pm on Sunday night does she finally remember what she forgot. And she feels Heartsick! And I sooo looked forward to meeting you in person! Well, at least I’ll still be able to go see all your art since it will be there for the month. And you could bet I’d be there Tuesday if I didn’t have my Earth School! LOVE LOVE LOVE your art and your books! Sorry that you missed the “book party”. It was fantastic to see so many people. And, yes, I hope that we will meet sometime in the future! I just received your book and it is just wonderful! I will enjoy studying all the special details! Fantastic, Salley!